It’s said that you can’t teach an old dog new tricks, but what about teaching a new dog an old trick? 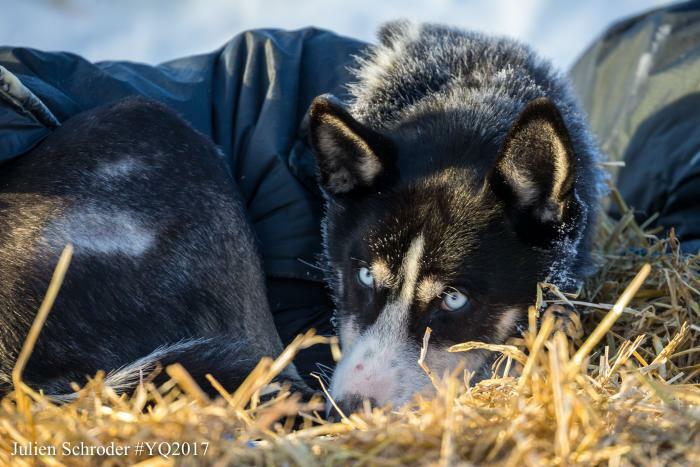 In other words, how do you prepare young sled dogs for their first long-distance race, like the Yukon Quest? Norris has the oldest Siberian Husky kennel in the world, with lineage dating back to the beginning of the breed’s bloodline. 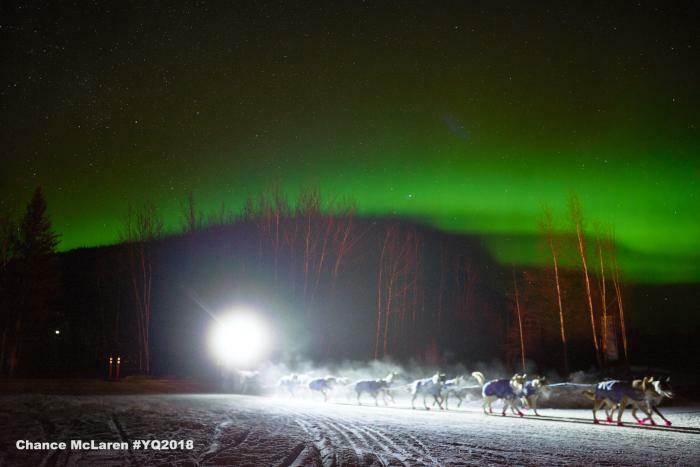 Team Anadyr (the official kennel name) has participated in many Fur Rondy and Iditarod races, but this is their first Yukon Quest, and a few of the team members are running their very first long-distance trek. Lisbet started distance training with her team in August when the temperatures were cooler and began at shorter distances. Each day she then gradually increased the length of the run to more closely match the run/rest pattern they will experience on the Quest trail. Both the Iditarod and the Yukon Quest are around 1000 miles long, but the Quest has less than half the number of checkpoints—the official sites to rest and refresh both musher and sled dogs. Fewer checkpoints mean more distance between restocking supplies so the sleds bear more weight throughout the journey. Less frequent contact with supply stations also means more time alone with the dog team. Dog Mushing is one of the earliest forms of winter transportation in the Arctic. Human emigrants from Siberia that came across the Bering land bridge into North America likely had dogs in their company. In fact, Alaska Natives instituted this travel mode millennia before explorers, prospectors, and missionaries adopted this cunning alliance with our canine companions. 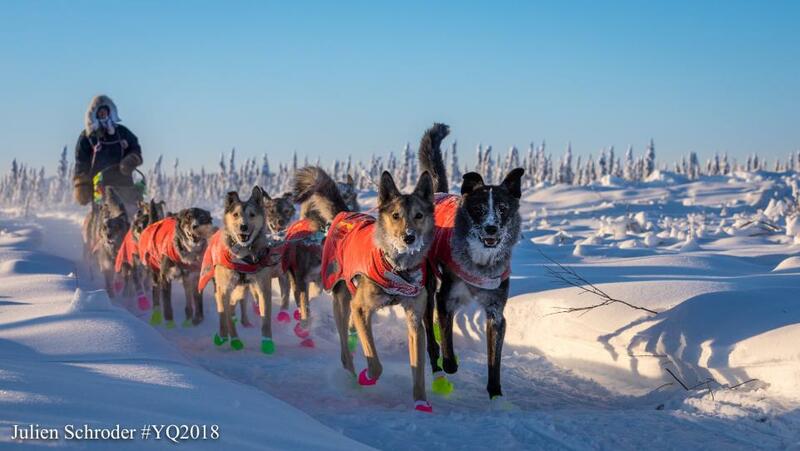 Today, dog mushing is the official Alaska State Sport, and competitive sprint and long-distance events, as well as mushing for basic transportation, continue to delight puppy lovers and race fans alike. 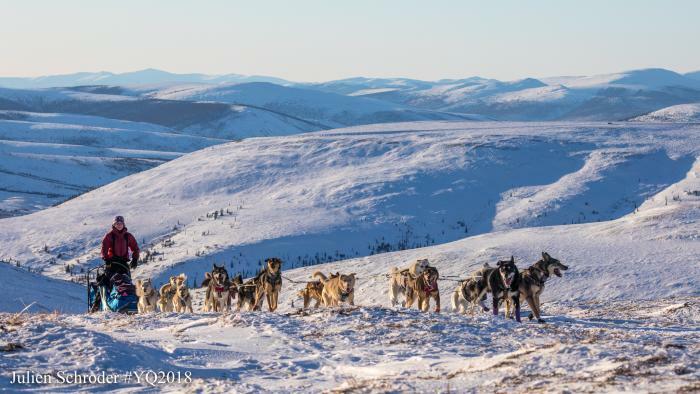 The Yukon Quest kicks off the racing season on February 2nd with an adventurous course only the heartiest souls would ever attempt to finish—a thousand-mile journey across the Arctic by means of a series of mail trails. Like the pony express, these seasonal routes once connected small settlements with the outside world. The first Yukon Quest 1,000 Mile International Sled Dog Race was run from Fairbanks to Whitehorse, YT in 1984. 26 teams started and only 20 completed the trip. Technically, every musher and team that year was a rookie, and Sonny Lindner won the race in a little over 12 days. Still, the race isn’t just a walk in the dog park. Preparing for any inevitability is critical to reaching the finish line. Steury says you can follow the mushers online throughout the race. Follow the race from start to finish online at the Yukon Quest website. Since its start in 1984, the race alternates the location of the start between downtown Fairbanks and downtown Whitehorse. This year, the race will start in Whitehorse and it’s one of those events that define both communities. 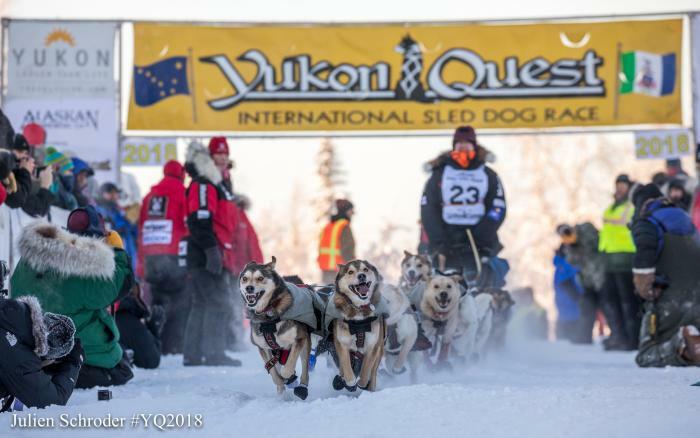 The Yukon Quest race starts on schedule regardless of weather and usually lasts from 9 to 16 days until the final dog team arrives at the finish line. The first 14-dog team leaves the chute with much fanfare and excitement and the remaining teams will leave in three-minute intervals from that point. Dress warm, come early and be there to cheer on the dogs and their mushers as they begin their 1,000-mile journey. There are four mandatory layovers during the race where mushers must stop for designated lengths of time. Run-rest schedules in between these stops are up to the mushers and dogs. 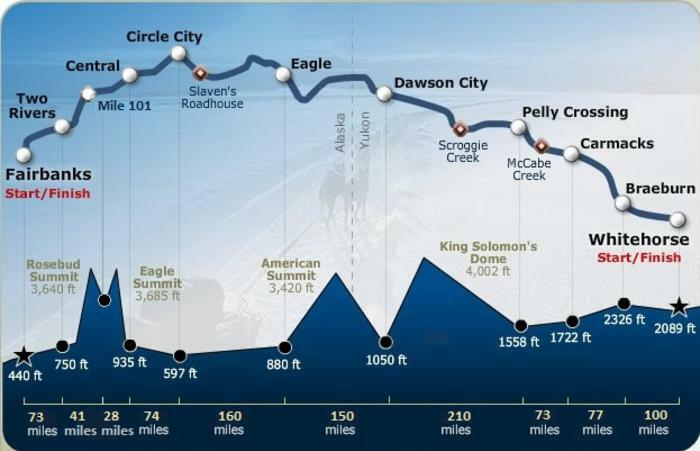 The Yukon Quest is the only sled dog race that spans two countries. 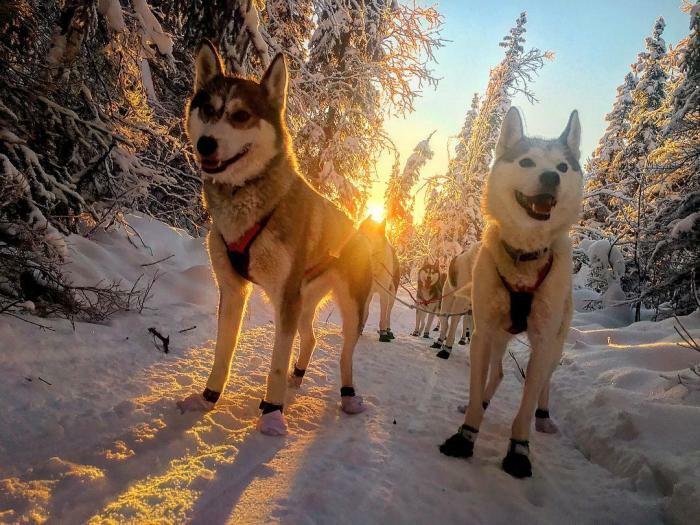 In fact, mushers need to carry their passports and their dogs must all have proper health certificates to cross the US-Canadian border, stopping to clear customs part way through the race. There are 20 vets from all over the world that follow the race and provide strict check-ups and care, examining each dog at least six times from the pre-race Vet Check to the finish line. Click here for 2019 race course changes.